For more information, call us at (618) 206-8655. We are open Monday through Friday from 9 a.m. to 6 p.m.; we are open Saturday from 9 a.m. to 2 p.m., and we are closed on Sundays. 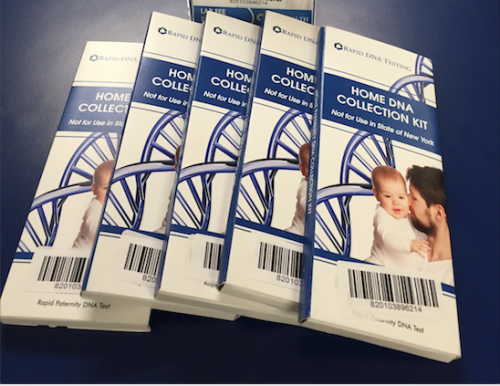 Rapid DNA Testing, a Division of RSC Health is pleased to announce they are now selling the popular Rapid DNA Paternity Test Kit at the Medicine Shoppe Pharmacy O’Fallon, IL location for an introductory sale price of $89 which includes all lab fees. The faster you can obtain paternity test results, the faster you can take action. That is the philosophy behind the Rapid DNA Paternity Test Kit. It seeks to offer easy access to DNA paternity testing. The kit is a do-it-yourself home kit that gives you everything you need to collect your sample and ship it back to the lab, including a pre-paid shipping envelope. The results are accurate, the process is simple, and it can all be done in the privacy of your home. You can receive confidential results in just two business days. The paternity kit will test for a relationship between one father and one child. Unlike other genetic testing where a person is charged not only for the testing but also for the lab work or results, the Rapid DNA Paternity Test Kit completes the process with one flat fee. Once the lab receives your samples, they will test a minimum of 20 more genetic markers, and run the DNA test (2) times at no extra charge to insure results are 99.98% accurate. Although rapid DNA paternity tests are not valid for legal evidence at this time, they are ideal to give you the knowledge you need and the peace of mind you seek if you question whether or not you are the father of a child. A test admissible in court must be done at a testing site. Collecting samples for personal use is an easy process that includes labeling the envelope, swabbing the inner cheek, sealing the envelope, and mailing the collection kit in the prepaid envelope to the laboratory indicated. Tests are completed within one to two working days after the lab receives your samples. The Rapid DNA Test Kit is affordable, confidential, accurate, fast and secure. The Medicine Shoppe Pharmacy of O’Fallon, Il. is located at 122 W State St, O’Fallon, IL. take I-64 to Exit 14 head East on HWY 50 for about 1 mile. Turn left on W. State St. Travel about 2 miles, and The Medicine Shoppe Pharmacy of O’Fallon is on your left.